After recently performing Samuel Beckett’s Not I (1972), actress Lisa Dwan wrote: “Only a few of us know what it is to hang in that darkness . . . till the curtain opens to let in the laser of light that fires the mouth and then to speak so fast you can’t think and think so fast you can’t speak . . . yet speak she must.” In the play, a disembodied mouth, illuminated by a single beam of light, spews an agitated text after a long silence. Save for this mouth, the room is pitch black, making the senses of those patrons in the dark acutely attuned to the language happening before them. For Sam Lewitt’s first institutional solo exhibition in New York, “Less Light Warm Words,” the artist employs a similar tactic. 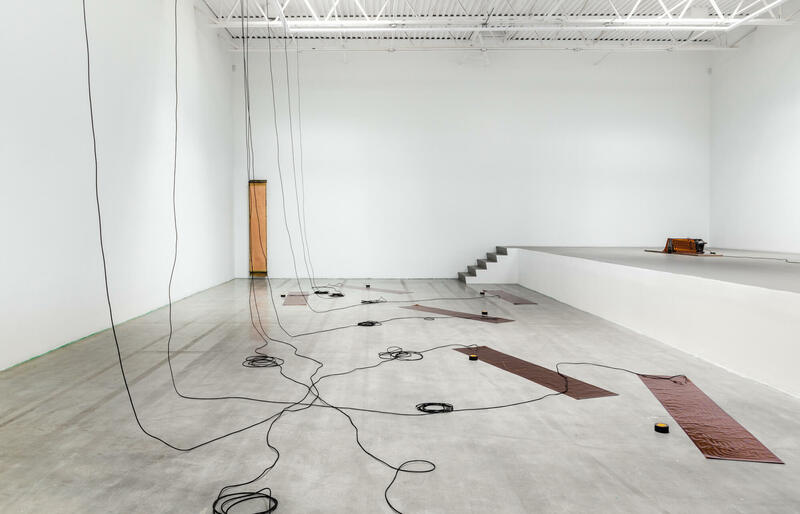 Lewitt has removed the fluorescent lights from the main gallery and redirected the electricity to ten slim, floor-based copper heating circuits. Virtually illegible pairings of words, some of which derive from industrial vocabulary—“VACUUM SEALED,” or “DEFOGGED MIRROR”—are written out in the circuitry on the heaters, implicating language in the pathway of energy belonging to each piece. The gallery is temporarily bereft of its fluorescent lighting, housing both a host of high-temperature electro-glyphs and, consequently, a heat unbearable in Manhattan’s summer months. Like the purposeful monotony of a spotlit mouth in the void, Lewitt’s composition of space and the speech acts it contains are here subject to concerted focus.